With its explosion in 2013, content marketing is part of almost every marketer’s 2014 plans. For marketers, the challenge is ensuring that every piece of content is effectively presented and distributed to reach its maximum relevant audience encouraging them to take at least an initial step towards purchase. 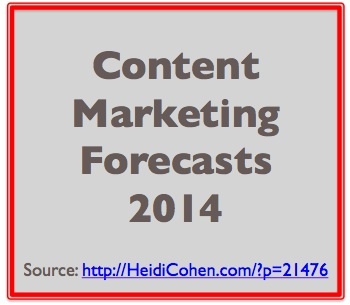 Here are 63 Content Marketing Forecasts for 2014 made by 24 content marketing experts. Content marketing will continue to grow and, much like social media, will become a distinct and unique part of a company’s overall marketing plans. Organizations will finally grasp the importance of storytelling and the resultant content when it comes to rich brand identity and long-term marketing opportunities. Lindsay Bell – Arment Dietrich, Inc.
Video will become the be-all/end-all of eyeball reaching in 2014. With the launch of Vine, then Instagram video and now Facebook video ads, organizations will buy into the appeal of these short form video formats, and begin to use them to their advantage in marketing. While personally, I think anything below at least a minute length in video is useless (I know, many will argue this fact) – brands will devise unique marketing opportunities using these short form video formats – and begin “micro storytelling” – whether I agree with the fad, or not. Lindsay Bell – Arment Dietrich, Inc.
Large-form experiential campaigns (like “West Jet Christmas Presents” viral campaign) will become even more important. Consumers are getting used to this “what’s in it for me” style of marketing, and brands will be driven to be more, do more, plan more and spend more on these big league examples of how to grab consumers emotionally, and provide the largest “shock and awe” surprise and delight opportunities possible. Lindsay Bell – Arment Dietrich, Inc. There will be a march toward content quality and a step away from quantity for many marketers. A lot of marketers will pull back on their frequency a bit. Andy Crestodina – Orbit Media; author of Content Chemistry. There will be a surge of podcasts and other high production value content. Andy Crestodina – Orbit Media; author of Content Chemistry. Records will be set in attendance of live events. I expect some of the big conferences are going to double in size. Andy Crestodina – Orbit Media; author of Content Chemistry. Quality content is the clarion call. In the past few years, we laughed when we heard someone was going to college to study journalism – it’s akin to opening a vinyl record shop on Main Street. But lately, we’re seeing those same journalists in high demand. Ric Dragon of Dragon Search; author of Social Marketology. DEEP investment in content is something we’re going to see more of. Let’s make the word DEEP bold, and increase the font size by 20 points. I’m not just talking about investing eight hours into a piece of content, but 80, or even 800. In fact, while you’re at it, hire a team of academics to conduct a study, the way Unilever did over a decade ago – and use that research to drive content creation for years. Ric Dragon of Dragon Search; author of Social Marketology. Brands are going to embrace the notion of passion-based marketing. While Red Bull is a great example with their focus on extreme living, even a brand like Capital One, in drawing the connection between “winning moments” and getting cash back on your credit card, shows that this idea has legs. Ric Dragon of Dragon Search; author of Social Marketology. There will be a big investment in mobile websites. According to Latitude, 61% of people have a better opinion of brands when they offer a good mobile experience. Smart businesses will gain a significant advantage in 2014 as they capitalize on the booming mobile trend by implementing mobile-based websites and content marketing strategies. With the rise of mobile device usage, GPS-enabled phones will increasingly use location and personal information to provide search results based on a user’s current location. While this technology already exists, it will become omnipresent by the end of the 2014. Brick-and-mortar businesses that fail to adopt location-based content marketing strategies will see sales erode as their competitors gain the advantage with location-based offers and content. Arnie Kuenn of Vertical Measures and author of Accelerate. We will see more regulations around native advertising. The use of editorial content for promotional or marketing purposes, is beginning to capture the attention of advertising regulators who are concerned that some content could be considered misleading to consumers. Pressure to create additional income has pushed many publishers to implement brand-sponsored content such as articles, video and images. Newspaper and magazine publishers have long run special ad sections, known as advertorials. But as the practice has shifted to the digital world, there are valid concerns that the lines between what is pure editorial content and what is advertising are increasingly blurred. Serious discussions are taking place and I believe they will begin to have an impact in 2014. Arnie Kuenn of Vertical Measures and author of Accelerate. We will see 108 more predictions that SEO is dead. I’ve been in the SEO world for more than 12 years now. I don’t think a year has gone by where someone has not proclaimed SEO is dead. It happens with major search engine algorithm updates, it happens with every major social media enhancement, it happens whenever Google slams a major brand. In my opinion, saying SEO is dead is just a failure to recognize it is an acronym not a methodology. SEO is marketing – for search engines. If you want your content to be found in the search results, you better “SEO” it. When search engines disappear, then I might finally go along with the idea that SEO is dead. Until then, I will continue to laugh at the novices trying to gain attention by adding that phrase to their next blog headline. Arnie Kuenn of Vertical Measures and author of Accelerate. In 2014, we will start to see mid-sized and large brands start to purchase traditional media companies and blogging sites that target their customers. Why? Marketers actually have a choice if they want to build or buy (most don’t think they have the choice). Sometimes buying is the answer since building a loyal readership is incredibly difficult. Joe Pulizzi of Content Marketing Institute; author of Epic Content, Managing Content Marketing & Get Content Get Customers. There will be a number of “content marketing is dead” articles that flood the scene. Content marketing will finally make the big time 😉 Joe Pulizzi of Content Marketing Institute; author of Epic Content, Managing Content Marketing & Get Content Get Customers. Regardless of what marketing experts say about the future of content marketing, they all expect content quality will improve. This means integrating content into the core of marketing plans so that each piece provides useful, branded information for prospects, customers and the public when and where they want to access it. Underlying this forecast is the need for improved promotion of each piece of content. What are your content marketing projections for 2014 and why do you think so? Tags Andy Crestodina, Ann Handley, Arnie Kuenn, CC Chapman, Connie Benson, Dave Kerpen, David Berkowitz, Dayna Rothman, Emeric Ernoult, Heidi Cohen, Ian Cleary, Joe Pulizzi, Jonah Berger, Kelly Hungerford, Kristi Hines, Lindsay Bell, Lisa Buyer, Michael Brenner, Mike Stelzner, Neal Schaffer, Nick kellet, Pawan Deshpande, Ric Dragon, Rob Peterson, Tommy Walker. Bookmark the permalink. Heidi very useful article. I agree with the forecasts you have made. Where do you see Google in 2014? I was particularly pleased to note the recognition in item #63 that marketers need to focus on “creating compelling content people actually enjoy”. Content that fails to emotionally engage will fall by the wayside as savvy marketers realize their message must be entertaining in some way in order to be consumed.